Tireless Dolphin Field Investigator Erik Evens finally has found his Dolphin! I thought that you should know that I finally bought a Dolphin! I'm the new owner of Yankee #118, Sunchaser. I bought her from Mike Olson, who bought her from Dylan (Pfiefer). I'll be renaming the boat ROBIN (Lee). I'll send a batch of photos along when I can. I just discovered that my boat is the boat pictured on the cover of the 1969 Yankee brochure. So she's a celebrity of sorts! I couldn't be more pleased. Thanks for the fine job on the site Ron! Robin Lee has begun her new life with Erik but will always carry her remarkable past with her. She started as the boat on the cover of Yankee's 1969 sales brochure shown at the left. Previous owner Dylan Pfiefer tells us a remarkable story about what happened in 2005. Don't miss it - It is included below. Webmaster Note: This brochure photo was involved in a small mystery involving a Pacific Dolphin brochure years later. See below.. In Erik's search for his Dolphin over the past year he provided this website with a lot of field intelligence about where Dolphin's were hiding - including getting us our first picture of Sunchaser! While Robin Lee will be going forward under her new name she has a very interesting history, some of which is below. Good Luck Erik and Robin Lee! On Sept 6, 2008 Erik sent in the following email (edited) and pictures. Here's the latest pictures of "Robin Lee " (below) . A couple right before haul-out, and a few as she was in the slings ready to splash again after her bottom work. We had her power washed, and then we sanded and did two coats of blue ablative bottom paint, three at the waterline. Sealed an annoying leak at the sink-drain through-hull. Painted the boot stripe, removed the old name from the transom, and then buffed and waxed the hull from waterline to sheer. Damn if she doesn't look almost new, if you don't look too close. :-) Not bad for a 40 year old boat that spent some time at the bottom of the briny marina. Down the road, we'll be adding a stove, recovering the interior cushions, and perhaps we'll try to find a spot for a holding tank for the head. Lots of sailing in our immediate future, though, as none of this list prevents an afternoon sail after the work is done. I bought a nice used headsail for a great price, about 110% and perfect as a working headsail. It's a nice complement to the 155% genoa (quite tired) that came with the boat. This sail inventory should tide us over until we spring for a new suit. Thanks again Ron for your fine website and your outstanding mentorship to our community! Hope you'll look me up if you get to SoCal. The before look was, well, unattractive and slow, and prompted Erik to post a plea on the Forum. Now he needs a wetsuit, goggles, fins, a scrub brush and willpower to keep it looking and feeling good - or a regular diver and $$$ will work too. It really does look a lot better. November 9, 2008. Erik sent in a progress report (minor edits) and some new pictures. Here's a few new photos of #118. We just had the name put on the transom. As you can see, we've extended the full name of the boat to "Robin Lee", including her namesake's first AND middle names. This was done because it has a romantic and somewhat nautical sound to it, we think. And it solves the "how do you fit a name with five letters around that backstay strap?" problem. Here is a shot of my brother Sean at the helm a few weeks ago as we played hooky on a Friday afternoon and sailed down to King Harbor. Just ordered a new main and 135% genoa, and a roller furler. Other recent improvements include a new vang setup, led aft to the starboard stopper bank, a new "tiller tamer" tiller lock, which allows me to set the tiller in a fixed position while single-handing, a new boom topping lift, and some new battery-operated LED lights in the saloon. My six month old daughter Lauren LOVES to sail, and we've found that her travel bassinette fits perfectly in in the aft seat of the settee, where it's braced from sliding off to port by the entry ladder. We can strap her in there and she is quite snug and safe if things are moving about. We are having the best time fixing and sailing this boat! Thanks for all the frequent news on the Dolphin community, Ron. 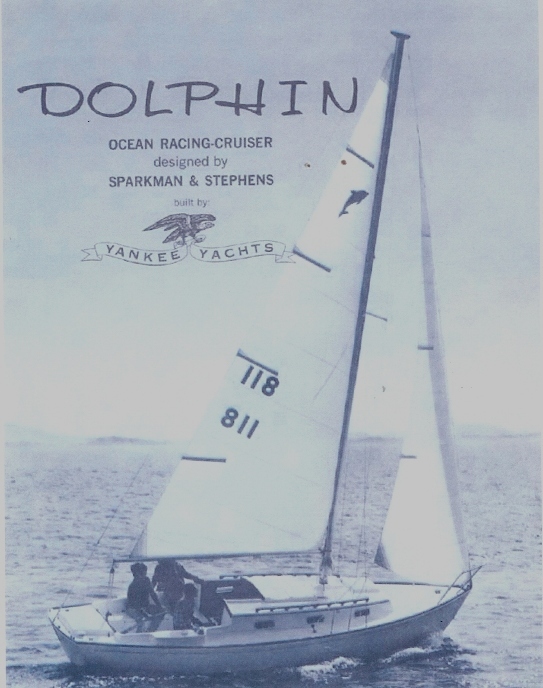 I am the very proud owner of Yankee Dolphin hull # 118. The story of how I got my boat is a great one. 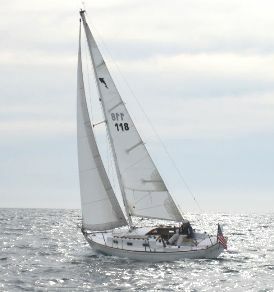 I am a sailboat rigger in Marina del Rey, Ca. I had a small racing boat on a dock there which I would sail often. Every time I would walk down the dock I would stop and gaze at a Dolphin sitting there being left to rot. A true crime! In 2005 California saw record rain, and in one of my frequent trips down my dock I saw a terrible sight. I saw three feet of the Dolphin's mast sticking out of the water. Apparently the heavy rain had overtaken the neglected vessel and sunk her. I happen to know the people at the dock master's office and I immediately started to inquire as to what would happen to the doomed vessel. A few days later I was in touch with the owner who in turn hired me to float the boat. By this time the boat had spent nine days under water. I got a few pool pumps and an old inflatable dingy and took action. After a long battle, which is another story, I had her floating, all the while wondering what the neglectful owner would do with my dream boat. After the owner came to see the boat my prayers were answered. The good man traded, my bill for floating the boat, for the title, and I, Dylan Pfeifer, was then the proud owner of a Yankee Dolphin 24. Consumed by joy a ran around the parking lot of my shop jumping and yelling, YES!!! YES!!! I then jumped head first into flushing the boat with fresh water and assessing the damage. True to form the Yankee held up to the marinading and emerged with little structural damage. All electrical and interior gear was lost, but all that I need is the shell. The refit of rigging and wiring was easy since I am in the business. First she was re-rigged, making halyards internal and all the bells and whistles that a professional rigger would put, and then re-wired. Six weeks later, with all the foolhardiness of a young salt, I dropped the lines from the dock for the first time in twelve years headed toward Catalina Island. How better to test a recently sunken boat than a 30 mile jaunt to emerald bay. Scared? No, I was on a Dolphin. The trip was a success and only confirmed the fact that I may be the luckiest man alive. Now, I spend a lot of time at the boat which still needs a lot of work. Proving my luck is not a fluke I happened to be docked next door to the finest dolphin I have ever seen, and it is a great example of what mine should look like. I love my little boat. 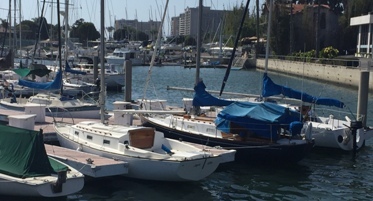 Sunchaser was owned, from 1981-1984, by Mark Spector who is the current owner of Yankee, Yankee hull # 138, also in Marina del Rey. Click here to see her . September 21, 2008 A mystery solved! December 29, 2008. Erik had a post on the Forum in the past few days regarding his boom. This prompted your webmaster to get the the mast and boom pages up on the Technical section of the website. Click to go there. The post gave us a status report on his work on Robin Lee. It is repeated here. I spent yesterday working on the Dolphin, and among other projects, I took the boom apart and examined, cleaned and lubricated the clew-end fitting and the gooseneck. I mounted a new cleat for the outhaul, replaced the internal outhaul line (the one that was there was old and worn and too large OD and difficult to make fast to the cleat). Then I reassembled all and fashioned a clew attachment that will work with my broken gooseneck fitting until I can replace it. So I guess I'll keep what I have until I replace the entire boom. I'll probably do that once I have all the rigging bits just where I want them...the existing boom thus serves as a full-size mock-up. My boom flexes as well when the wind is up, and it has a bit of a permanent bend in it, the crown of which is the boom-vang attachment point. I think that I'd go with a slightly deeper section if I were to replace it. Put on my new JSI sails yesterday. They look very good as far as I can tell, from dockside. All the dimensions seem perfect, and the detailing and workmanship are first-rate. No time for a sail yesterday, but I'm planning for an afternoon jaunt today. I'll report in after I've checked them out. 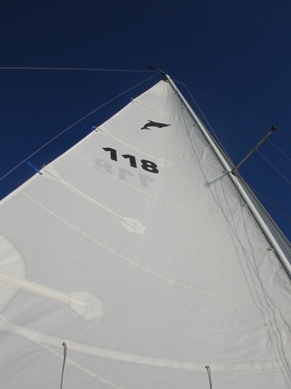 Finally got to go sailing on a sunny day and I got a nice photo of my new mainsail (attached). The sails are beautifully done indeed, well made, nicely shaped and smartly detailed. They fit perfectly right out of the bag. A great bargain, I'm very pleased. I've included a few photos of a few details of the mainsail. These sails will last a long time, I'm sure. I can unreservedly offer JSI as a recommendation for our fleet. July 7, 2009. Erik sent in a couple of photos of Robin Lee's new varnish, and the following email - excerpted. ....Just cleaned all the teak on Robin Lee, and did 6 coats of varnish. My goodness, what a difference. A couple of pics attached. We sailed twice over the holiday weekend, including yesterday in a fresh 14-18 knots. Single reef in the main, 130 genoa, and we were flying! Gorgeous evening indeed. 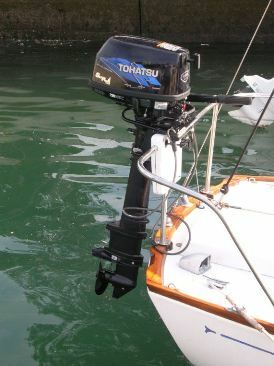 February 1, 2010 Erik made a post today on the Forum regarding Robin Lee's transom well, transom well plug, and her Tohatsu motor. You can click here to read it in full with pictures . Below are 2 of the pictures that appear on the Forum, and edited excerpts of Erik's comments relating to these pictures. I've had a chance to get my new Tohatsu 6 hp extra-long shaft engine up and running. Still breaking it in, but so far, so good. So far the motor seems to be a very good one indeed. Came all the way from Tennessee to California, and I took it out of the box, put oil in it, filled the gas tank and hooked up the hose, and pulled the starting cord ONCE. Started right up. 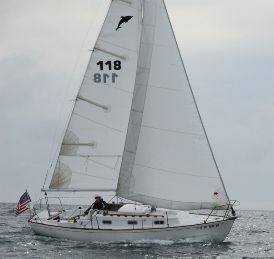 Got some nice photos of Robin Lee on a daysail last week. I posted them on the Forum in the General section. Also a link to a Youtube video that my friend Bill took the same day. A couple of the photos might be a nice addition to #118’s page. Hope all is well! There is also a link to some video taken of Robin Lee. Click here to see it. Here's some of those photos for Robin Lee's page. 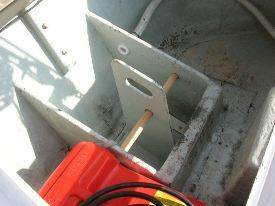 April 5, 2010 - Erik sent in a picture of his Tohatsu and how it rotates in the transom well. We put it in the Technical section/Outboard motors. Click here to go to it. June 15, 2010. 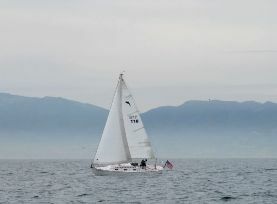 Erik's friend, Bill Hogan aboard his Flicka 20, Nomad, shot some video of Robin Lee beating to weather in 12-14 knots on Santa Monica Bay last week. Click here to see it. December 7, 2010. Erik posted a documentary with photos on the Forum "Just Me and My Dolphin", an account of his solo cruise with Robin Lee to Catalina Island - click here to go to it. We put the link in the Stories Section as well. We're still here - and have been sailing a lot lately. 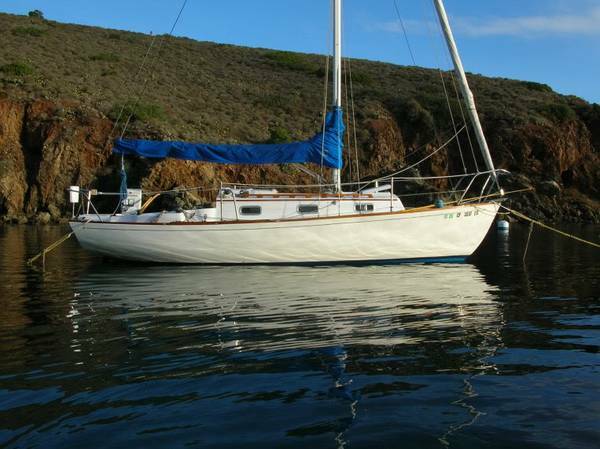 Interesting note: In the advertisement for "Colossal", the Dolphin for sale in Ithaca, NY, the photo used in the flyer taped to the bow of the boat is actually a photo of Robin Lee at mooring in Catalina Island. Ha! Those that must check out the bullet Erik dodged, click here. All is well here, Ron. Good to hear from you. Robin Lee is safe and sound. Not much to report. 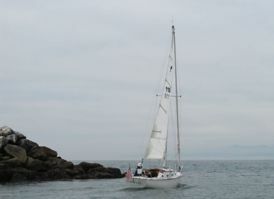 We've been using her mostly for daysailing, as life is very busy right now, no time for any extended cruising. Still in the same slip in Marina del Rey, next to Aspara. Hope all is well, and that you have enjoyed your summer! We went for a lovely Labor Day afternoon sail yesterday, and I noticed that we have two new Dolphins on our dock, making four Dolphins in total. It's really looking like a proper Dolphin yacht club, don't you think? New additions are "the Blue Dolphin", Dario's "Breeze", #83, which was moved to "Dolphin Row" from another slip elsewhere in the Marina, and "Avri Ellis", #140, which I gather just arrived from the south in Wilmington. See photo below I took yesterday. Also attached is a photo of Robin Lee and Aspara bookending the other end of "Dolphin Row". Now we need a few more to fill in the middle and we'll have a proper fleet! Not much is new here. 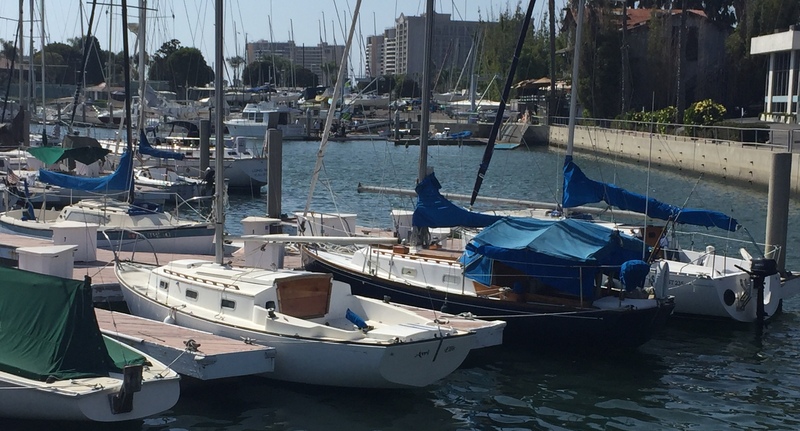 Robin Lee is fine, nestled in her berth on Dolphin Row here in F Basin in Marina Del Rey. We are sailing her when we can, although life is very busy with many distractions. Not much to report, Ron! We have been sailing off and on, same as always. About a month ago, we were gybing in 8-10 knots of wind, and the boom broke right at the attachment of the vang. Original aluminum boom, so I guess you have to say we got our money’s worth out of it! I’ve ordered a replacement extrusion and a few new parts, and we’ll build a new one. Hope all is well in Connecticut!